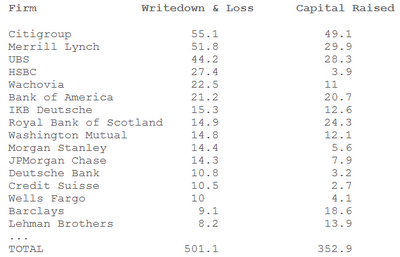 Bloomberg is reporting Banks' Subprime Losses Top $500 Billion on Writedowns. Bloomberg (and others) keep referring to this as if it was a "subprime" problem. The reality is this was an unsustainable worldwide credit boom of epic proportion. Let's now take a look at the article. Banks' losses from the U.S. subprime crisis and the ensuing credit crunch crossed the $500 billion mark as writedowns spread to more asset types. The writedowns and credit losses at more than 100 of the world's biggest banks and securities firms rose after UBS AG reported second-quarter earnings today, which included $6 billion of charges on subprime-related assets. The International Monetary Fund in an April report estimated banks' losses at $510 billion, about half its forecast of $1 trillion for all companies. Predictions have crept up since then, with New York University economist Nouriel Roubini predicting losses to reach $2 trillion. "It just keeps spreading from one asset to another, so it's hard to know when these writedowns will stop," said Makeem Asif, an analyst at KBC Financial Products in London. "The U.S. economy needs to stabilize first. But even then, Europe could lag and recover later. There's still a lot more downside." Auction-rate securities have begun adding to the losses as regulators and prosecutors force banks to buy back bonds they'd sold as safe investments. UBS set aside $900 million to cover potential losses from repurchasing the securities, while Citigroup Inc. and Wachovia Corp. estimated losses at $500 million each. Using Roubini's estimate of $2 trillion in losses, it appears like we are in the top half of the 4th inning. Another way of looking at things is that it's "$500 billion down and $1.5 trillion to go". More importantly, it is going to be increasingly difficult for banks and brokers to raise the capital required to support the expected losses. Massive shareholder dilution is coming.